LANDOVER, Maryland, April 1, 2011 (ENS) – Five of the largest commercial vehicle fleet operators in the country today joined President Barack Obama in launching the National Clean Fleets Partnership to help reduce America’s oil imports. AT&T, FedEx, PepsiCo, UPS and Verizon – which collectively own and operate more than 275,000 vehicles – have agreed to replace their gasoline and diesel powered vehicles with advanced technology vehicles or ones that use electricity, natural gas, biodiesel, ethanol, hydrogen, or propane. They also will incorporate fuel-saving measures into their daily operations. Their planned current and near-term petroleum reduction strategies will account for the deployment of over 20,000 advanced technology vehicles and annual petroleum displacement in excess of seven million gallons, according to figures released today by the Obama administration. “One of the best ways to reduce our dependence on oil is by making our cars and trucks more energy efficient, because transportation accounts for more than 70 percent of America’s oil consumption,” said Obama at the UPS Capital Division DC Building. In 2008, America imported 11 million barrels of oil a day. On Wednesday, the President set a goal of cutting that amount by one-third by 2025. While Obama said today that the federal government is leading by example by doubling the number of hydrid cars and trucks in its 600,000 vehicle fleet, he traveled to Landover for the clean energy vehicle event at the head of a 15-vehicle motorcade of petroleum-powered cars and trucks. Before his speech, Obama viewed a display of clean energy vehicles from UPS, Verizon, Frito Lay and AT&T, asking about their capabilities and offering approval. He saw a fully electric Frito Lay delivery truck and Verizon’s hybrid Silverado. He investigated two AT&T vehicles, a natural gas-electric hybrid repair truck and an all-electric vehicle used in Dallas. AT&T expects to buy 18 more EVs by the end of the year, partly because operating costs are about one-third those of a standard vehicle, Obama learned. Myron Gray, president of U.S. operations for UPS, and Scott Wicker, the company’s chief sustainability officer, showed Obama a plug-in all electric vehicle and a low emission hybrid. 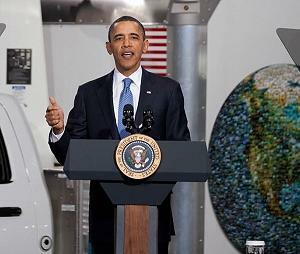 “How much more are you paying to have a hybrid electric?” Obama asked. Gray said the truck cost $95,000. “It’s double the price” of a conventional truck, but gets one-third better miles per gallon,” he said. “We’re reducing our greenhouse gas emissions by about 25 percent,” Wicker told the smiling President. By joining the partnership, companies of any size can access group purchasing so that smaller companies work with their larger peers to get the benefits of purchasing advanced vehicles in bulk. The Energy Department has developed a wide range of technical tools to help partner companies navigate the world of alternative fuels and advanced vehicles, such as cost calculators, interactive maps, customizable database searches, and mobile applications. This Department of Energy initiative will compliment the U.S. Environmental Protection Agency’s Smart way Transport partnership program with the freight industry by furthering efforts to improve efficiency in goods movement and further reducing dependence on oil imports.